Nordik Tutorial number one and two! 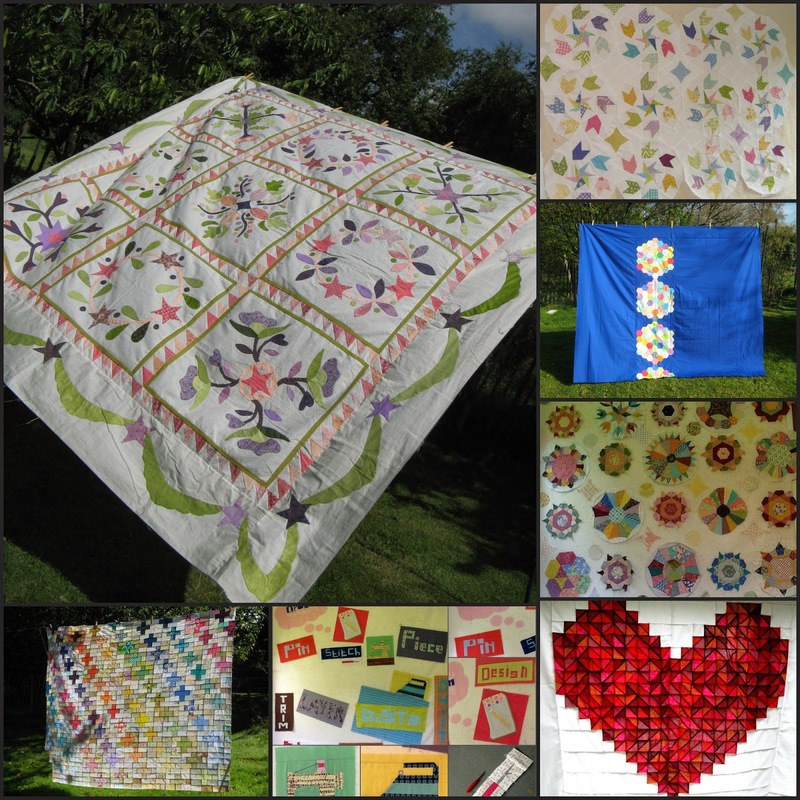 If you read yesterday's post here you will know I am wanting to make a Nordik Winter quilt with help from my bee. 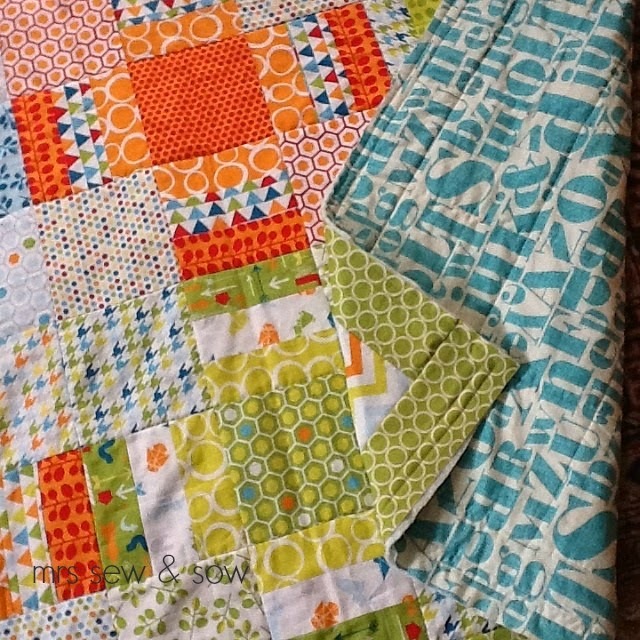 I have already made some blocks but want to allow them a choice in selecting a block within a Nordik theme! 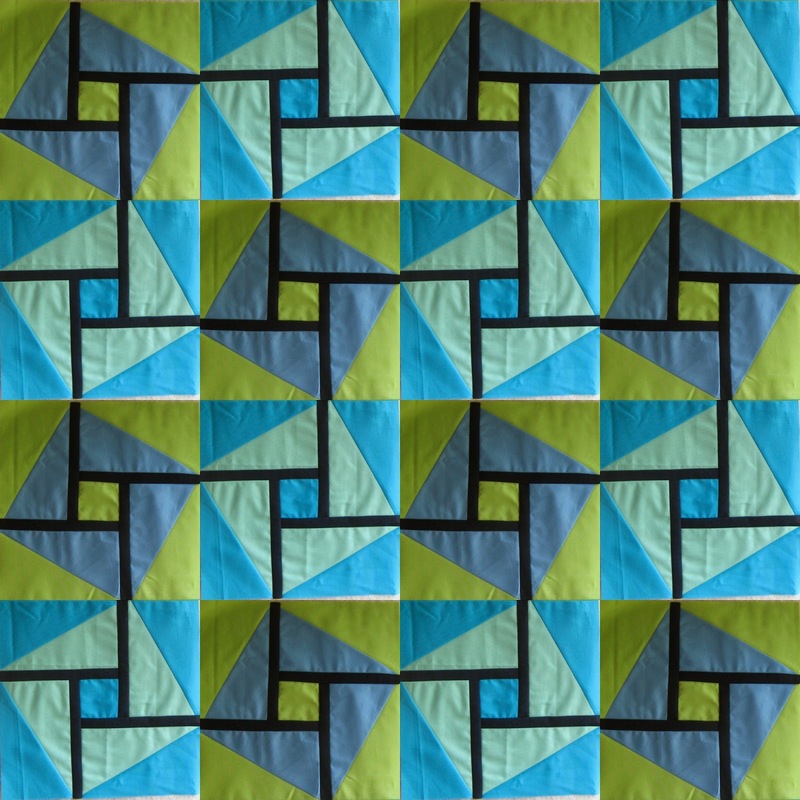 In case they really are up against it I am writing tutorials to show how I made my blocks but it also help me remember too! 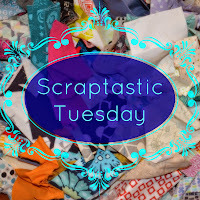 This first one is so easy that you are bound to know how to make this already! 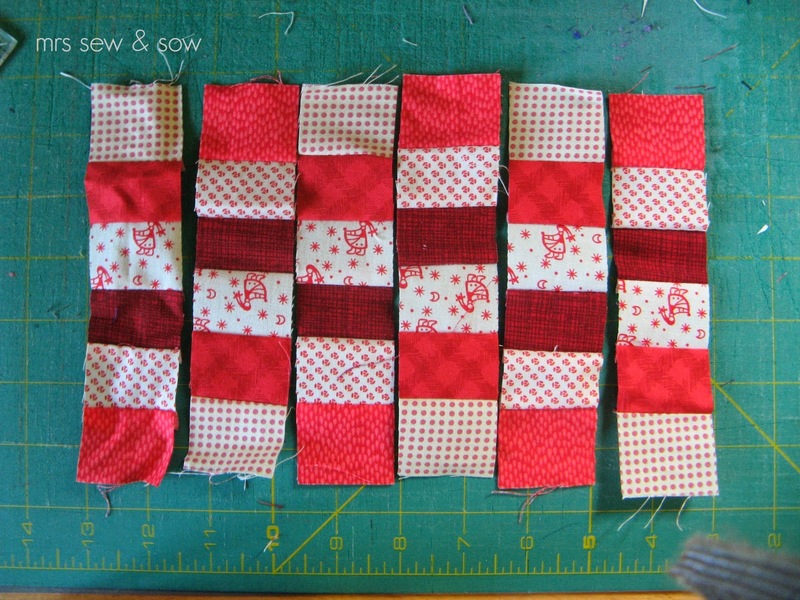 Cut six strips of fabric 1.5" wide and stitch together in a pleasing arrangement. 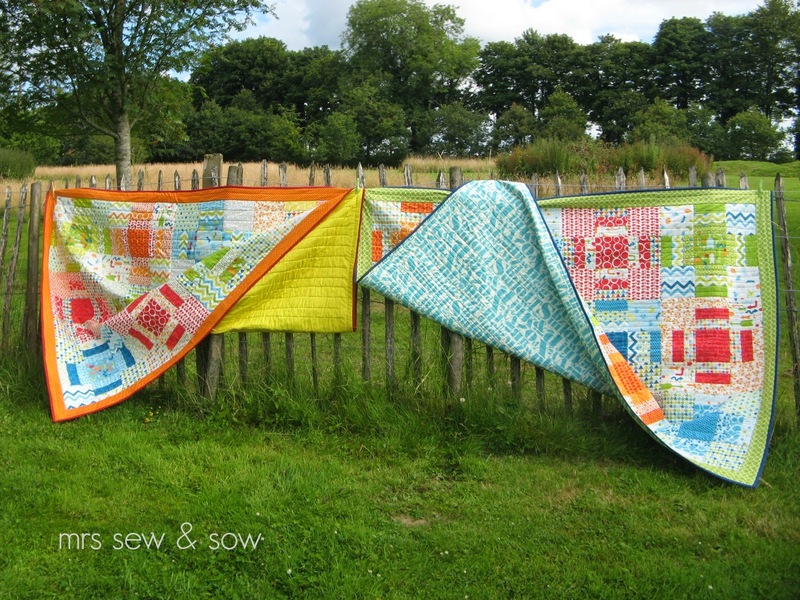 You do want to ensure you have different colours on each end! Press seams to the dark side! 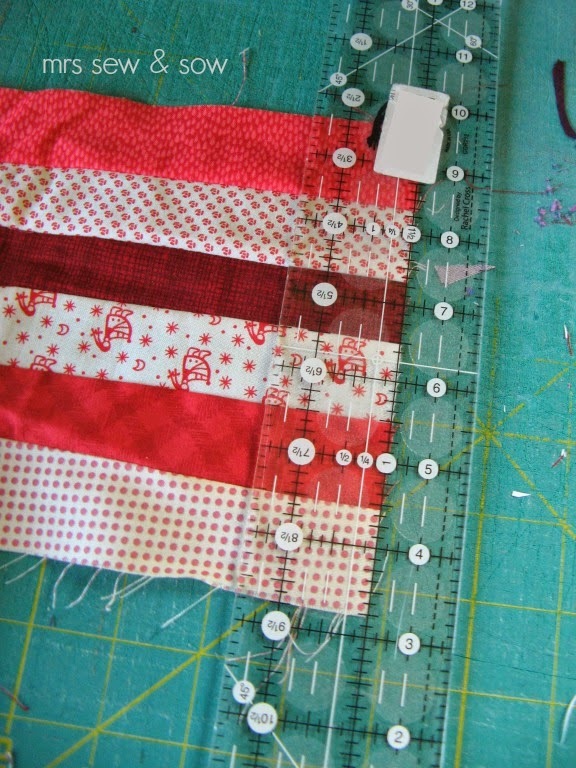 Cut strips across the seams in straight lines at 1.5" intervals. 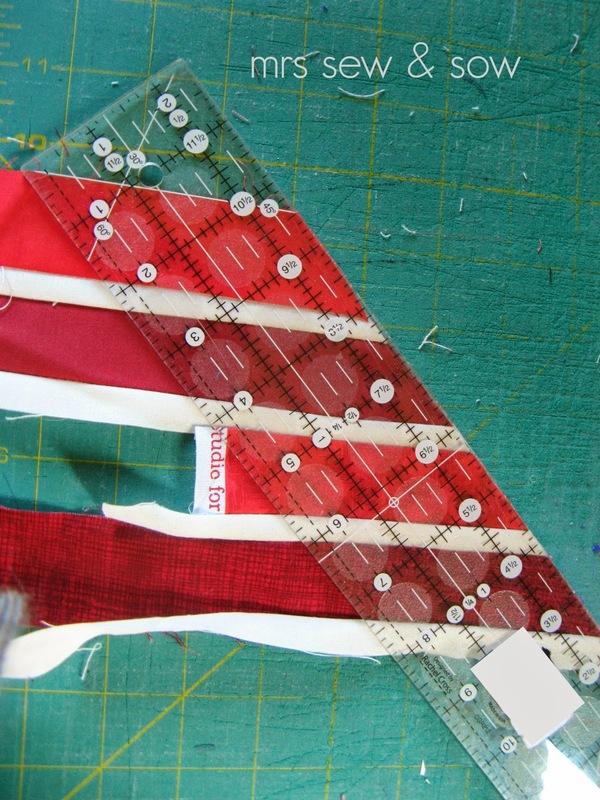 Next you alternate the strips - now you know why the end strips need to be different colours! 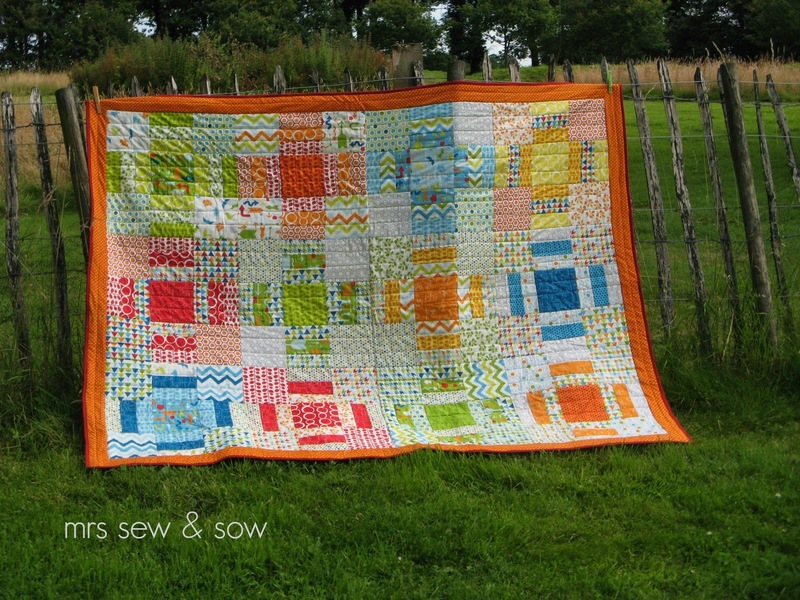 Now stitch up the new strips matching your nesting seams and your block is complete! See photo at the top! 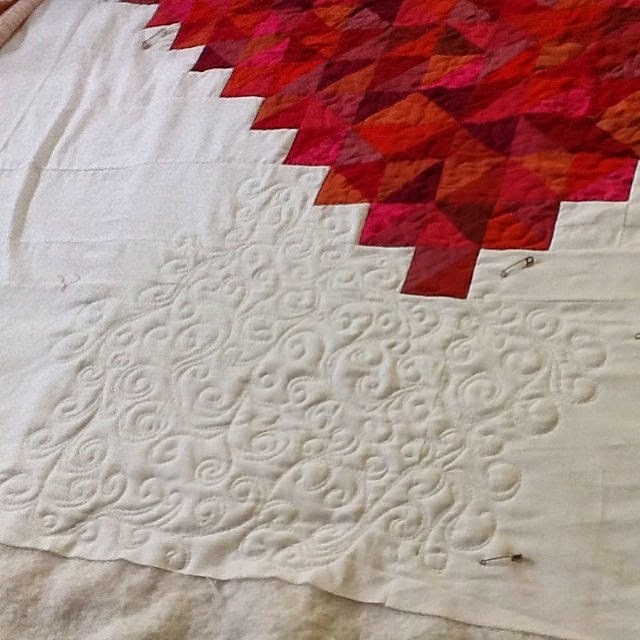 Best to press at each stage and not be lazy like me who unearthed my crumpled strip set from under a heap of fabric and thought it was too hot to get the iron out! 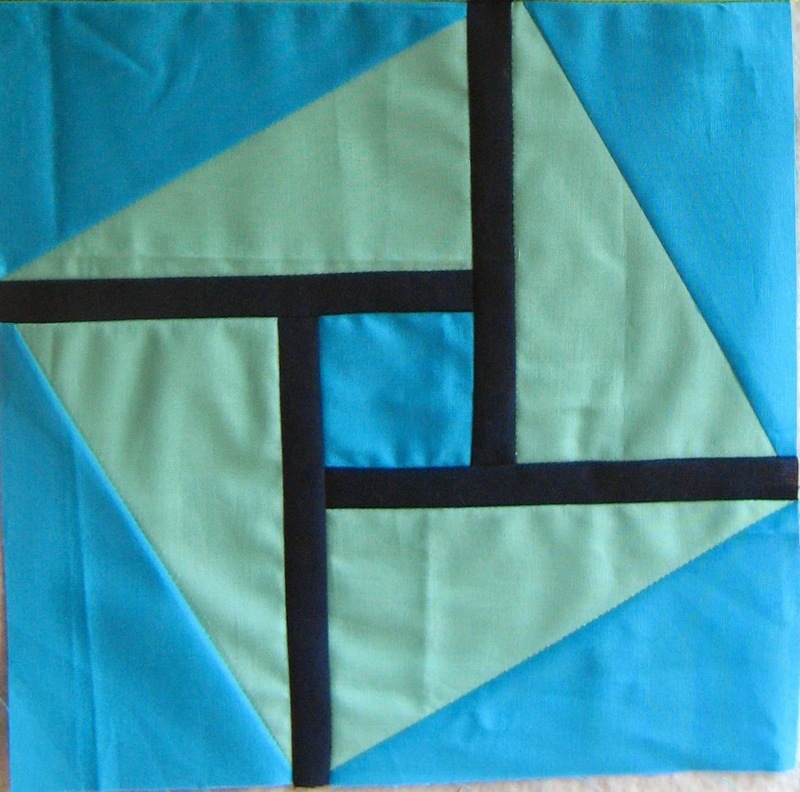 It looks complicated but uses the same techniques of building up a strip block as above. 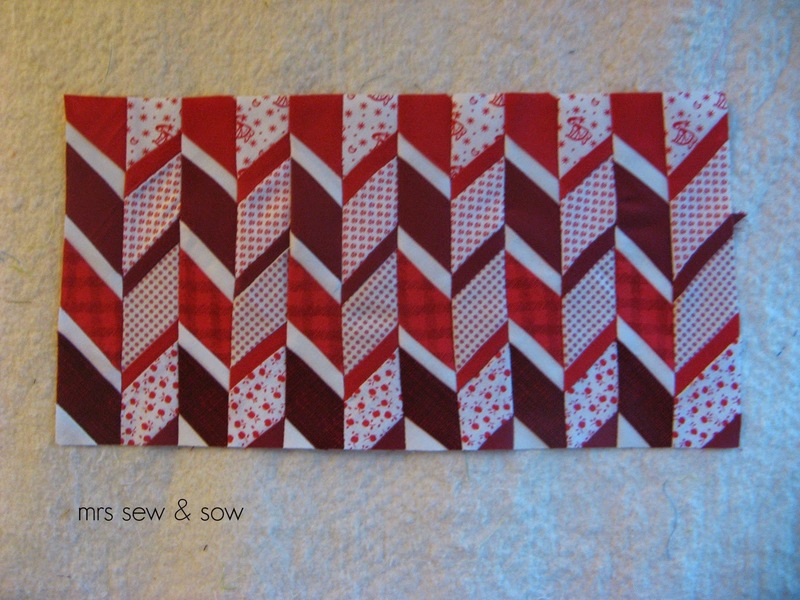 This time the strips are 1.5" and 0.75" wide . 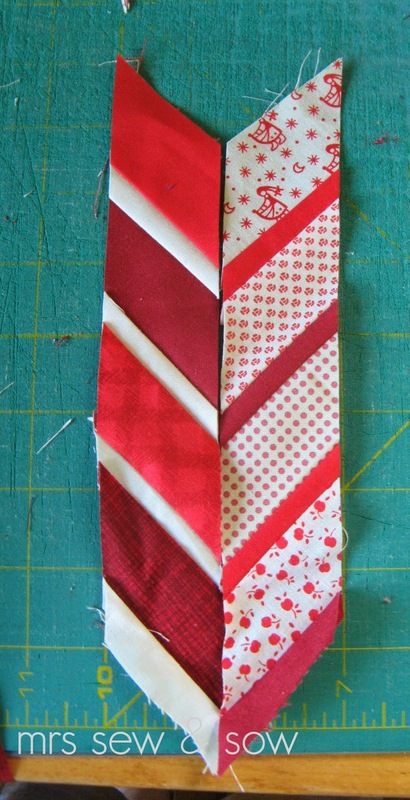 and the other with red print 1.5" strips and white 0.75". Once the strip sets are complete carefully press to the dark side again. Now comes the big difference. 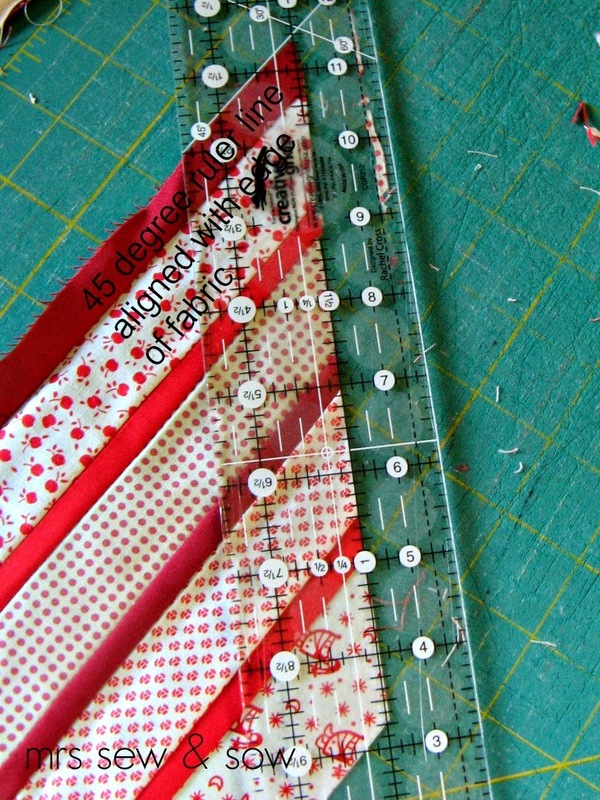 Instead of cutting across your strip set at right angles as before you now use the 45 degree angle on your ruler to cut diagonally across the first strip set. 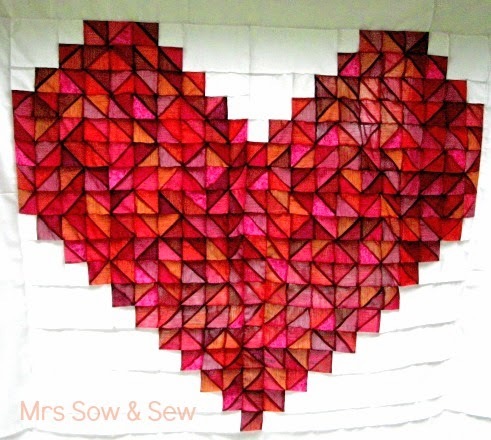 You will have a bit of wastage with this technique - making the first angle cut to get your 45 degrees line. 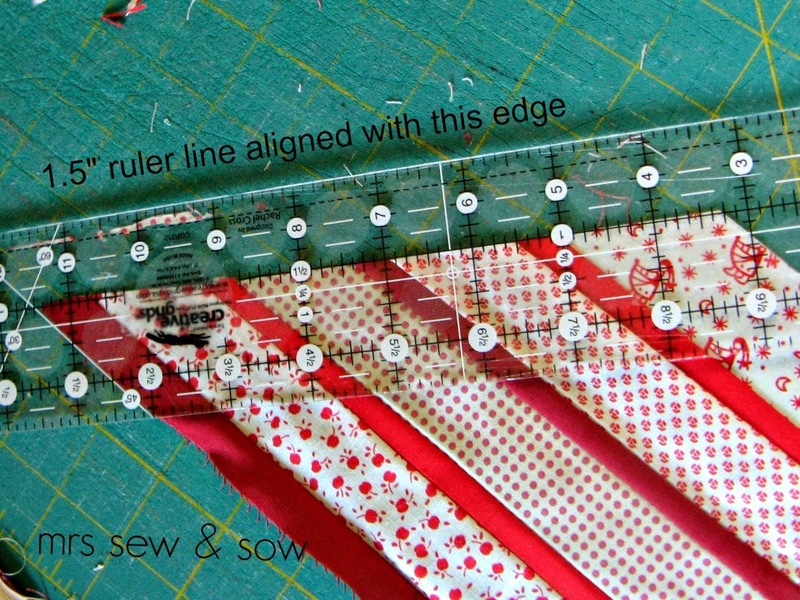 Thereafter you line up your ruler as shown. 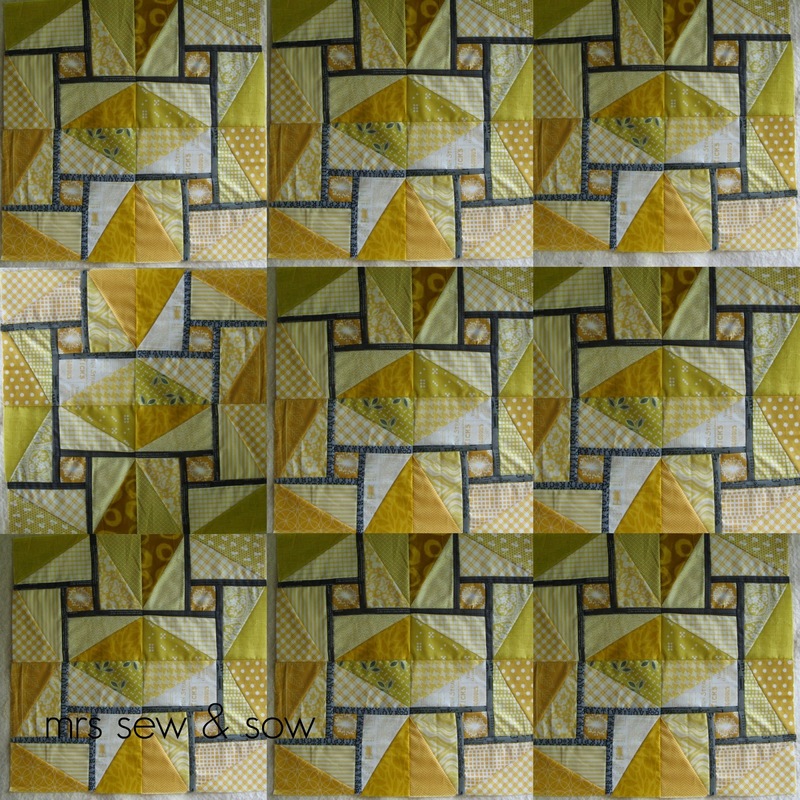 As I'm re-using my strip sets I cannot show you the triangle I cut off when I first made a 45 degree cut but that is what you do! 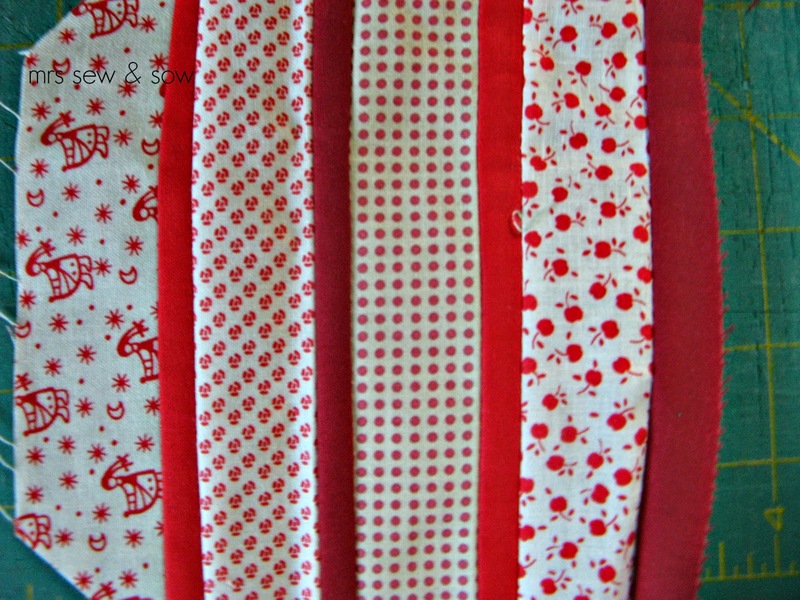 See below the ruler markings I am lining up to the edges of my fabric - I turned the photo around so you might see better but it is the same photo and you don't need to do this! 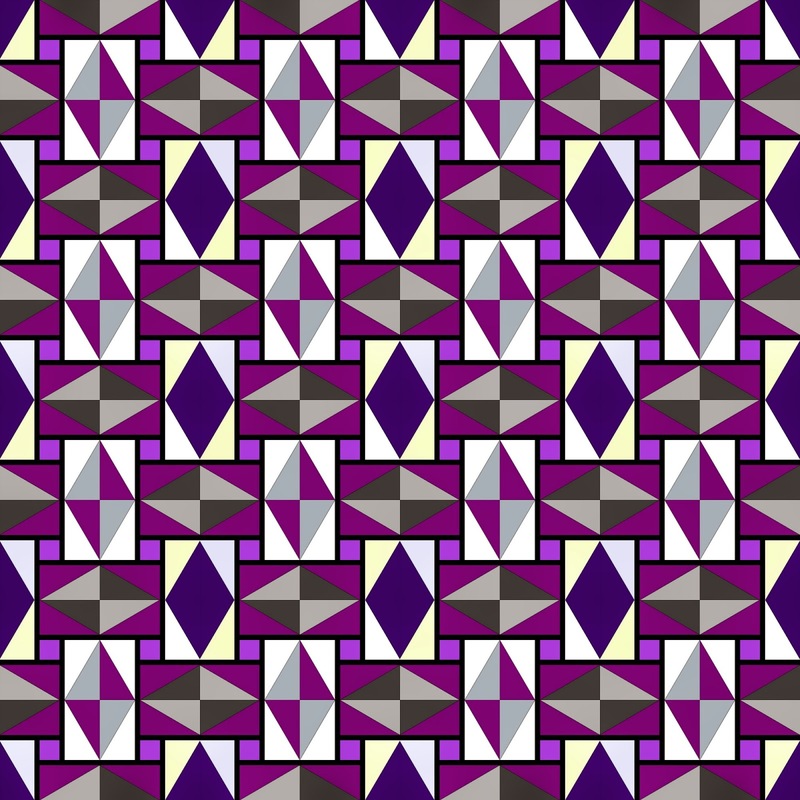 Next you cut the second set in the opposite direction - this is the bit that does my head in! 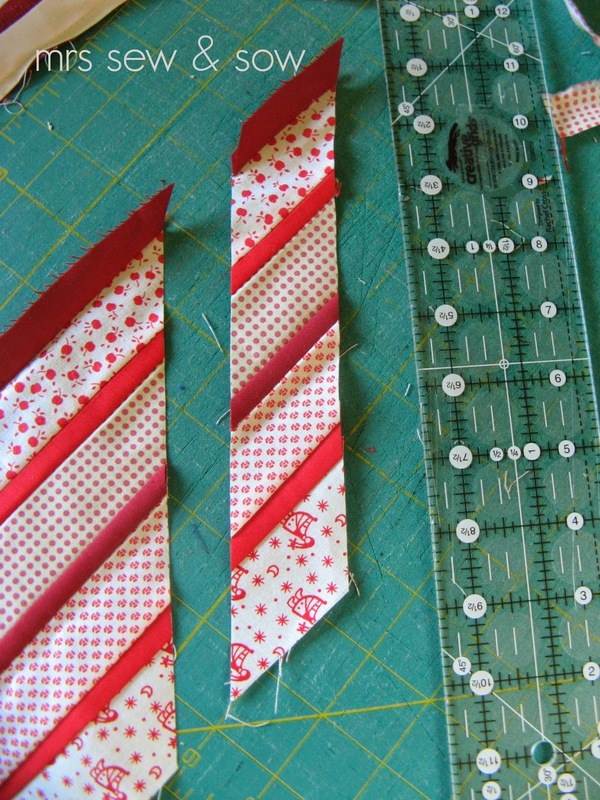 I've learnt my lesson - check twice by putting your first strip on your second strip set and cut once! 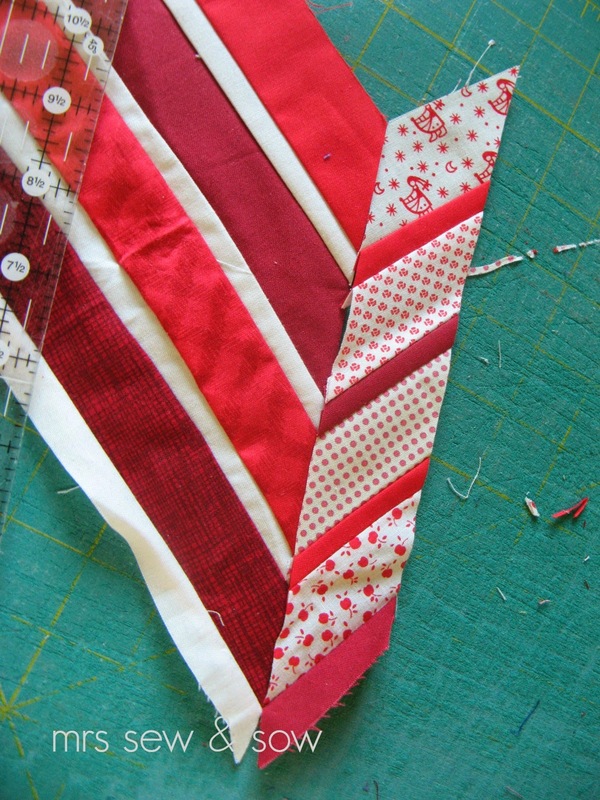 Oops just showing the 45 degree angle in this photo - you still need to cut at 1.5"
Stitch the different coloured strips in pairs making chevrons and matching seams. 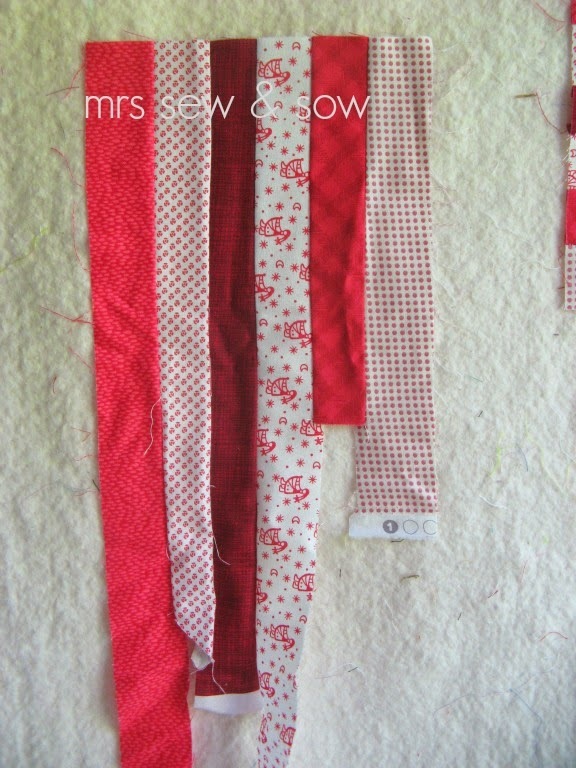 There is a bit of bias stretch in these strips which can work to your advantage to match those seams. 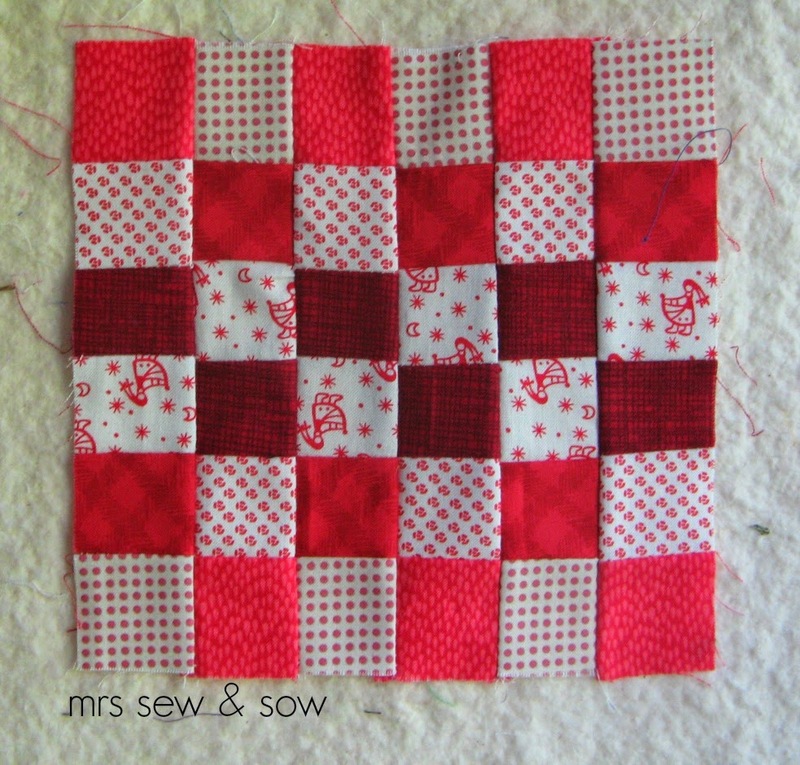 Now stitch the pairs until you have the desired length of block. 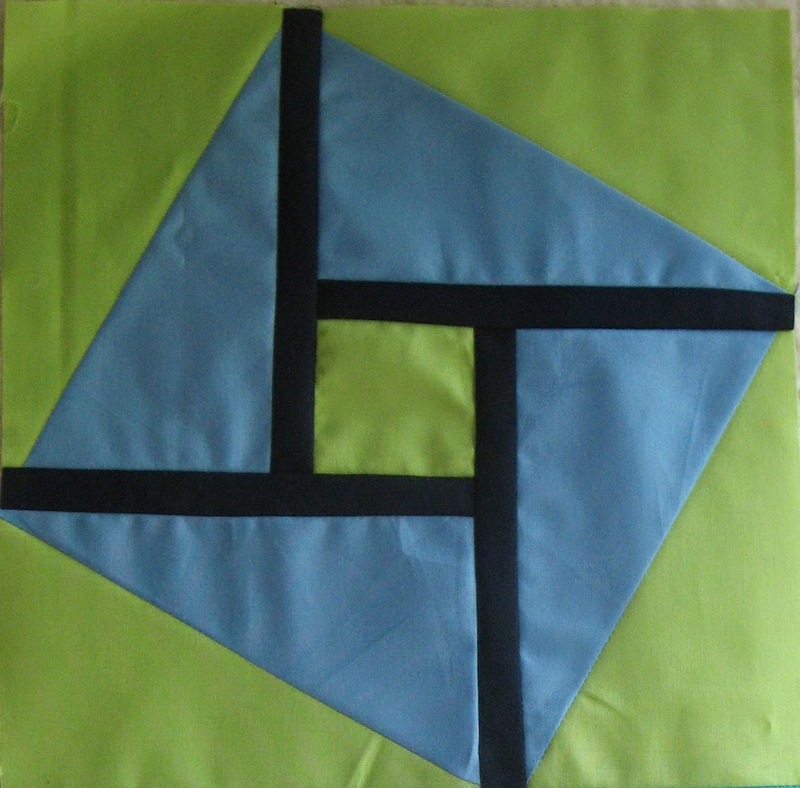 You will need to trim it square. 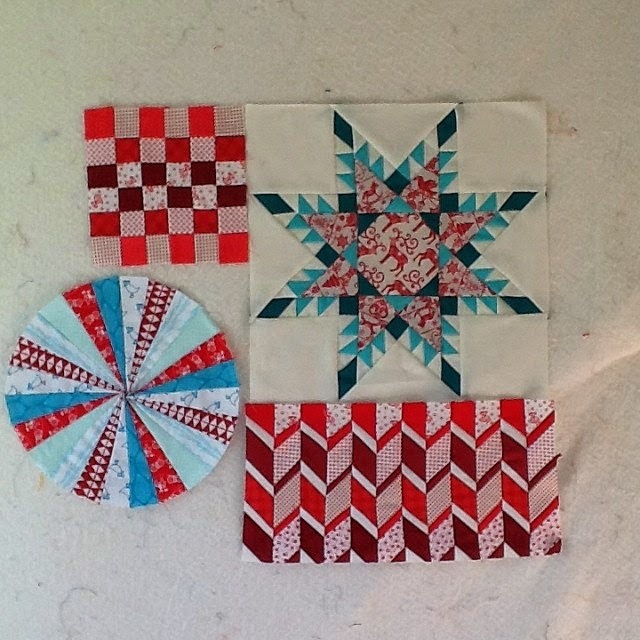 In case you are interested this is called Seminole patchwork and was used by the Seminole people who often made very elaborate patterns in this way. 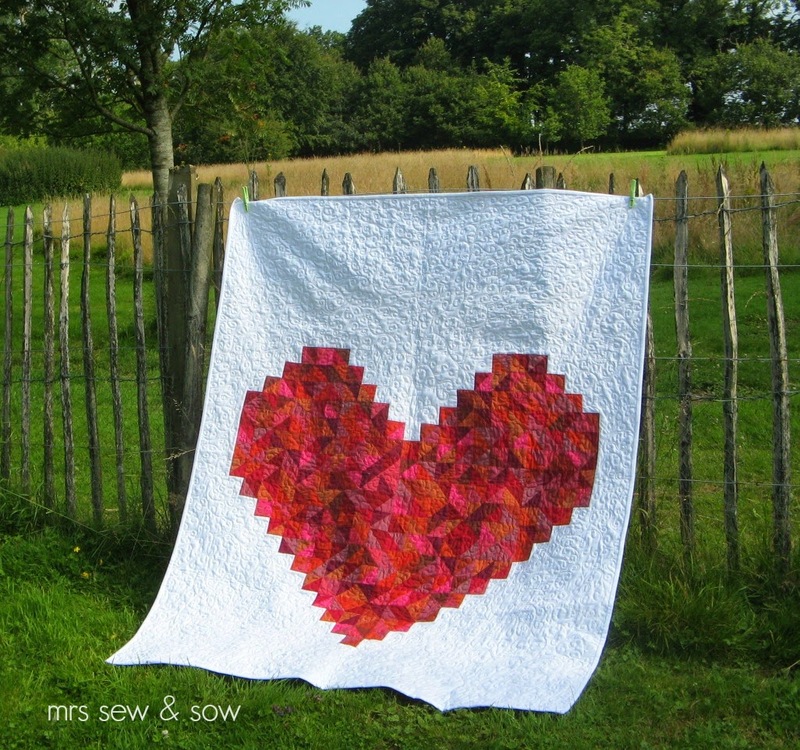 This is just one possibility prompted by a Scandinavian knitting pattern - a very simple way to make something look quite complicated! I love it! 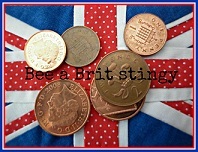 I'm Queen bee for my lovely Stingy Bee Mates in August! 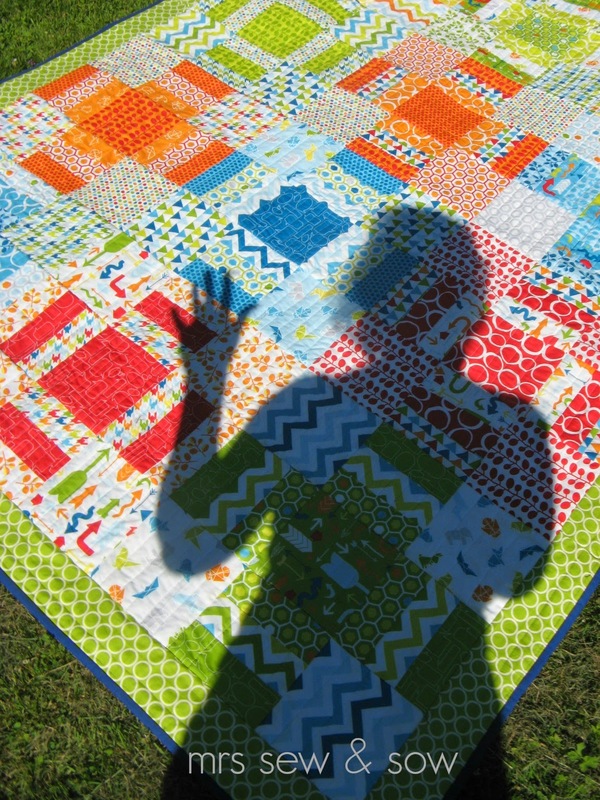 I am so excited - I have been planning my quilt for months ! Though in a way I cannot plan for this one! 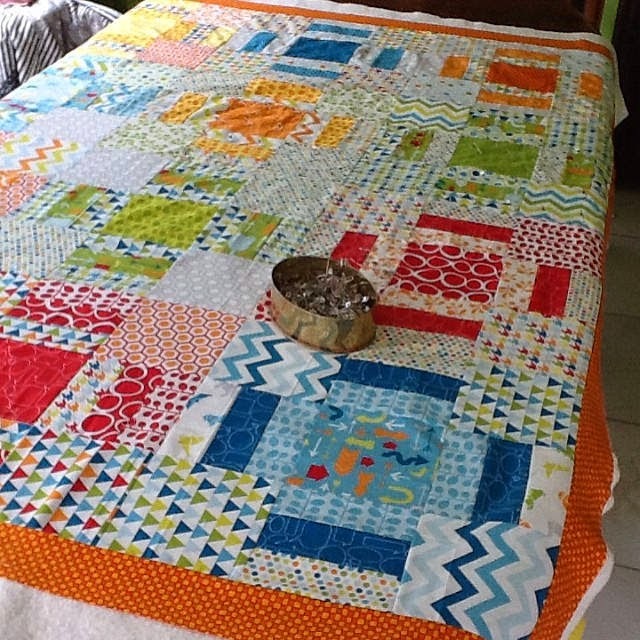 I have made Christmas sorry Winter quilts for my children but don't have one for our king size bed. 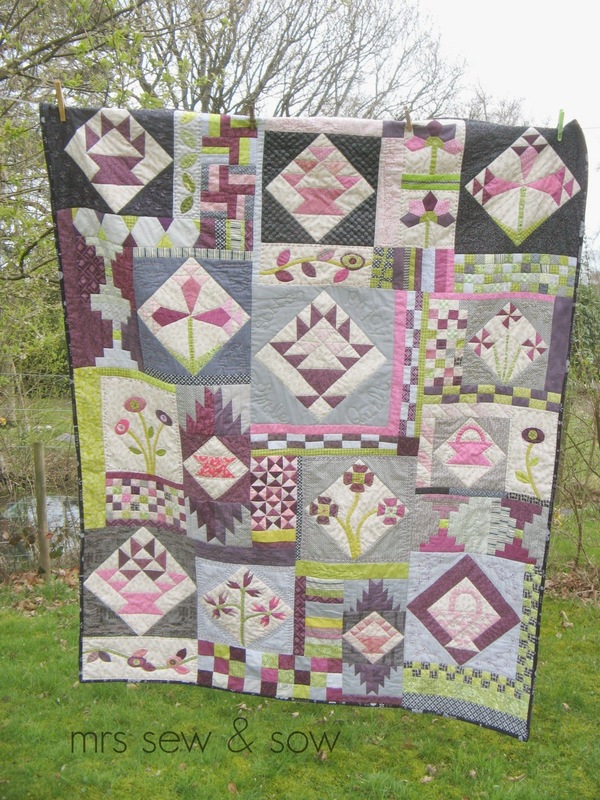 I love Green Tea & Sweet Bean style sampler quilts and used the idea of the GT&SB quilt to finish this UFO - a mix of pieced and applique blocks, different sizes, blocks, borders and filler strips held together with a restricted colour palette. 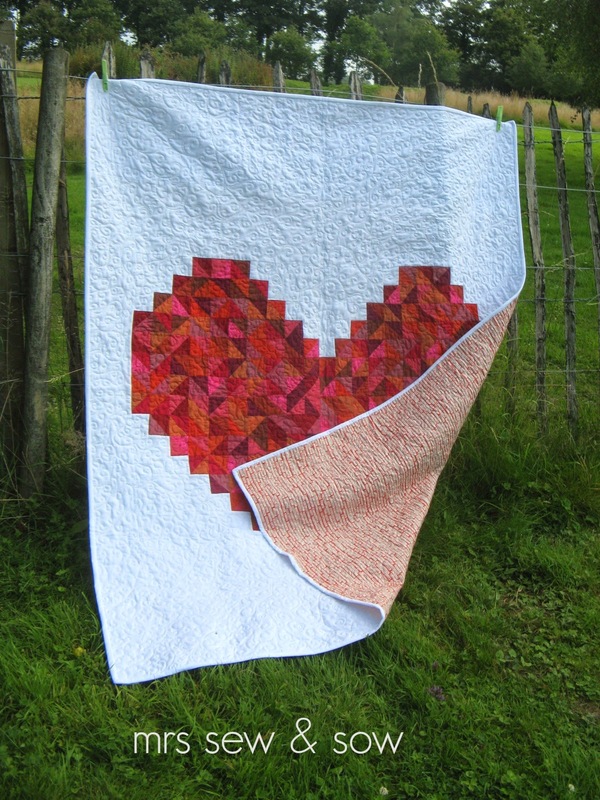 So now I'm wanting a sampler style Scandinavian themed Winter quilt made from a variety of blocks, using different methods and a variety of sized and scaled blocks. 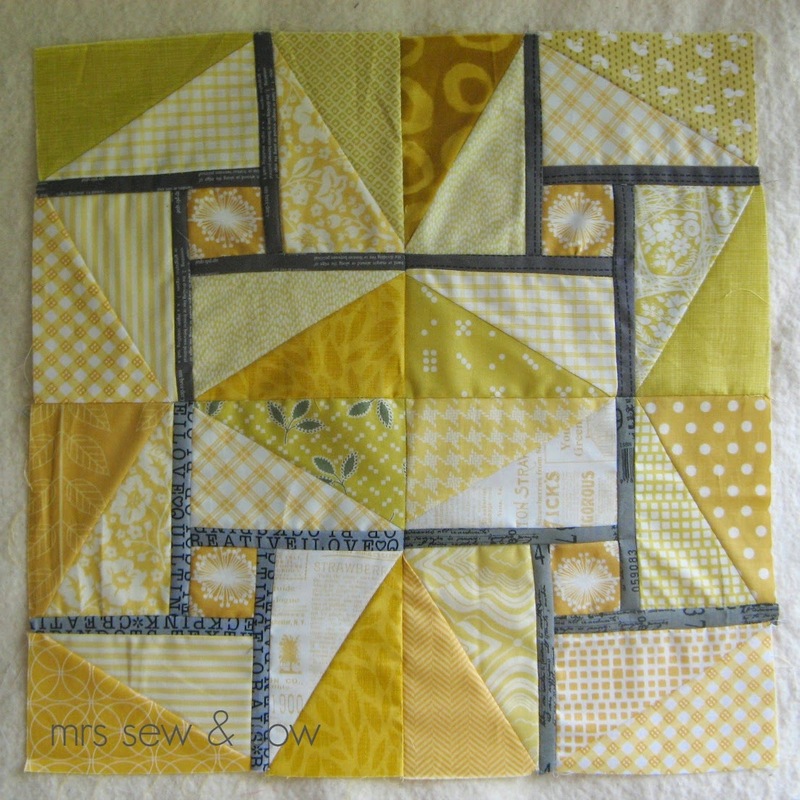 A mix of border patterns and blocks - my Dresden plate needs an applique centre and background! 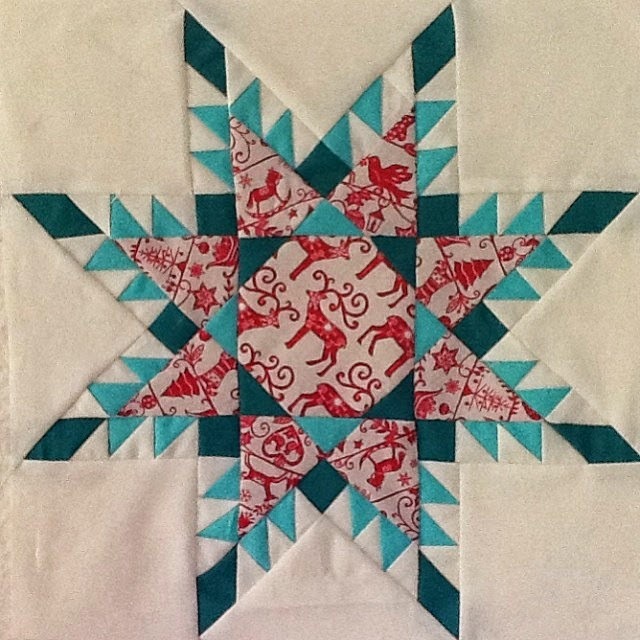 A chevron star block based on the Le Moyne star with a strip of background fabric in between! 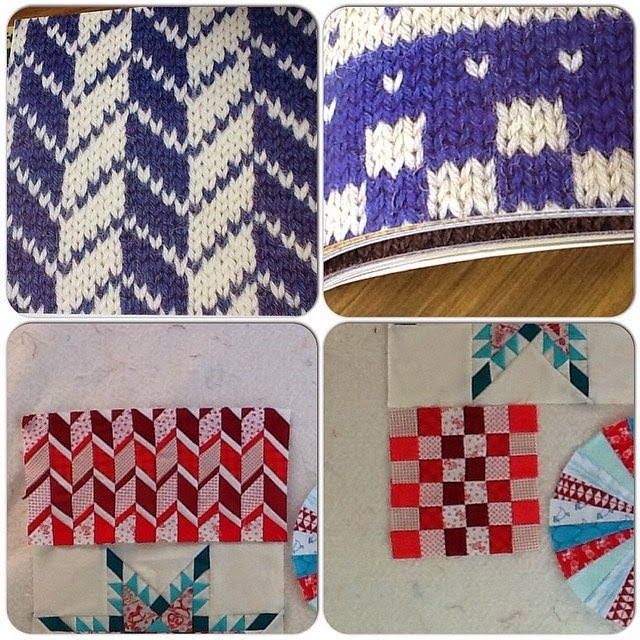 I have a pinterest board full of Scandinavian inspiration - quite a lot of it is knitwear! 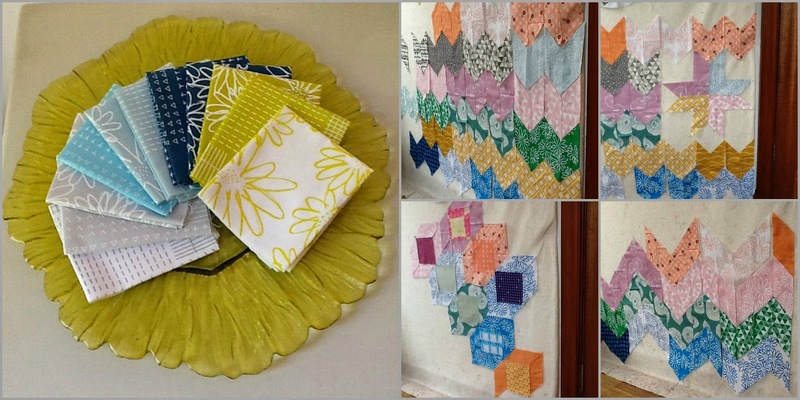 And here you can see how I was inspired to develop these blocks from knitting patterns! Scrolling was so much fun! My job is done here so I can hand it over to my lovely daughter! 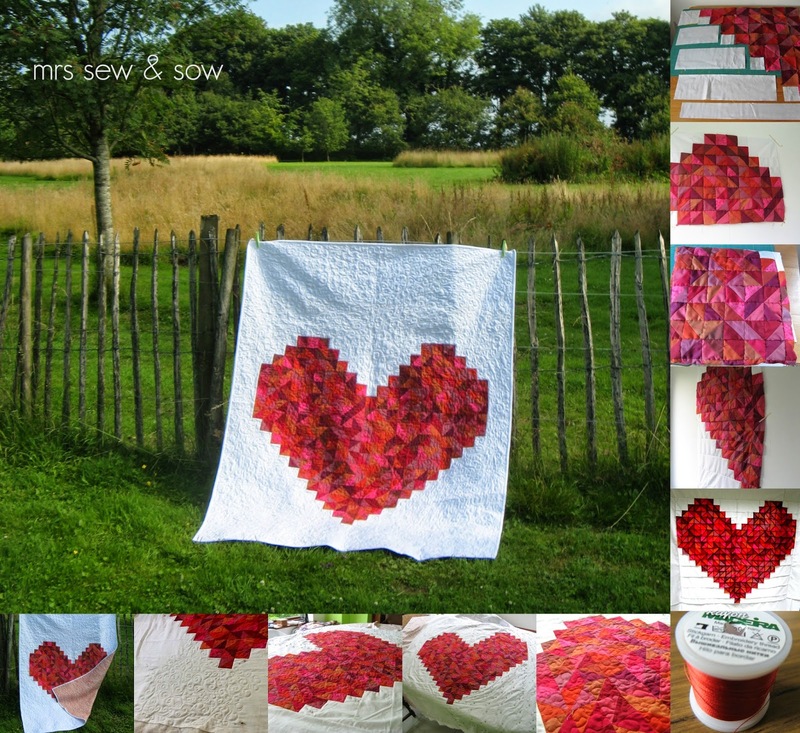 Pattern: by V and Co - I rarely use a pattern but was taken by this one! I'll just be scrolling around for the next few days and trying not to get a pain in the neck again! and try to forget about it? and you could have done it ages ago? 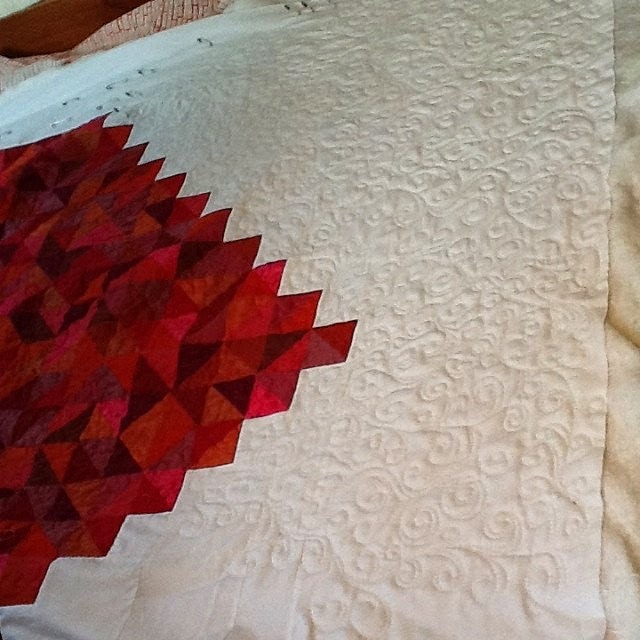 This wasn't very flat ....so I ironed it! 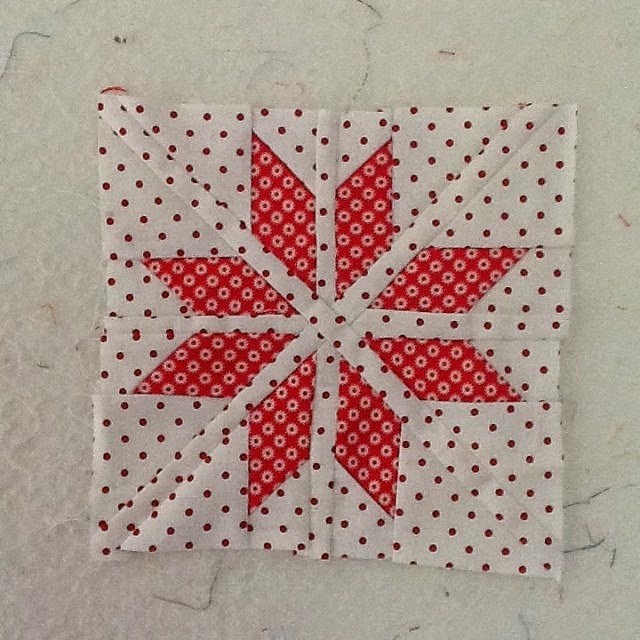 I decided I wanted to quilt it with some shiny Rayon Madeira embroidery thread - I was scared of that Rayon thread ....so I practiced with it! 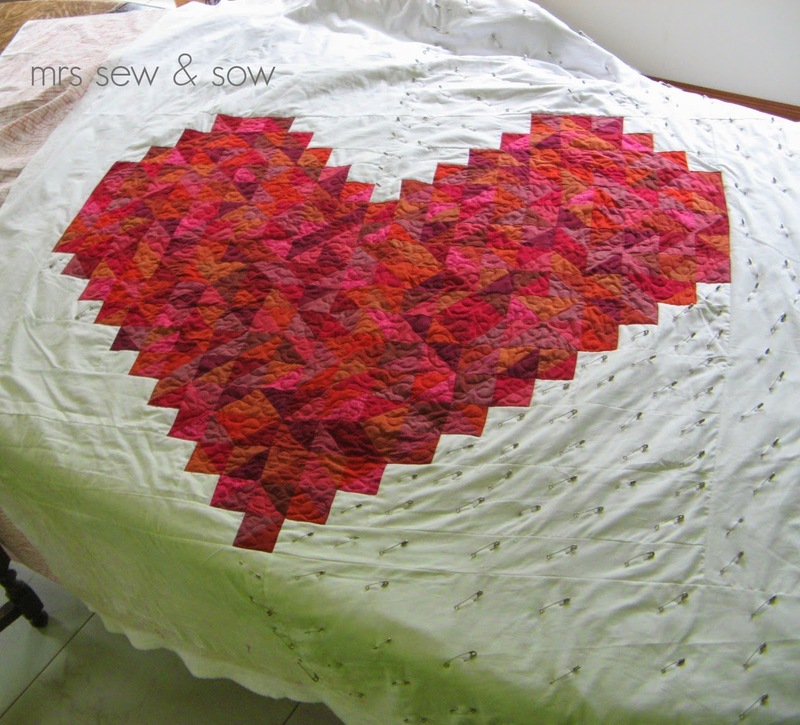 I pinned the heart a lot ....and it went surprisingly. 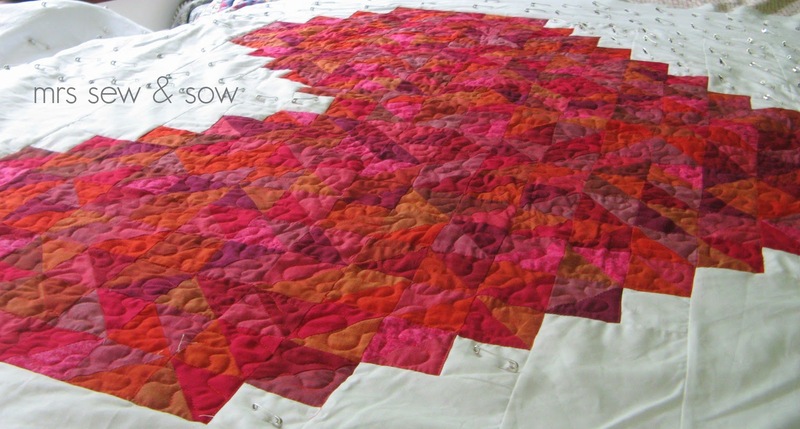 I love the shiny thread on the shiny Oakshott fabric. 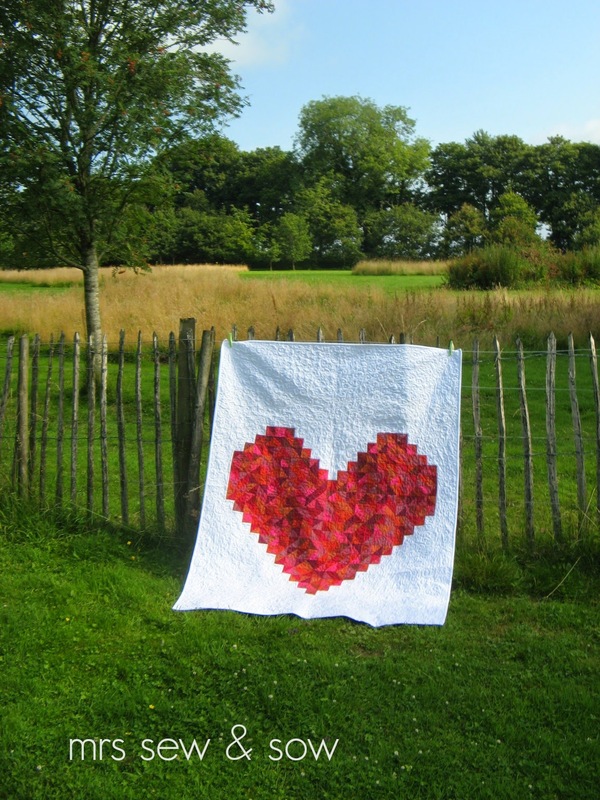 The heart is all quilted and I'm trying to decide how to quilt the background. I got cutting at the weekend and started making Mark II! 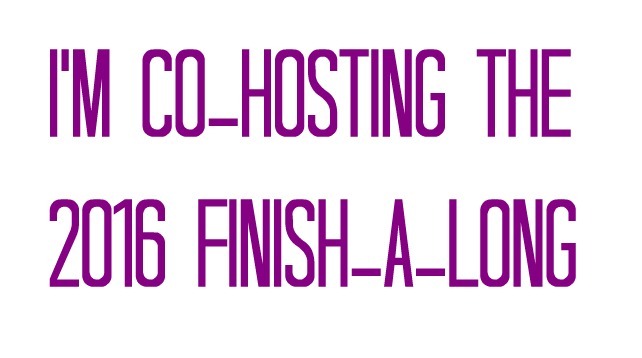 Even quicker once you've done it before of course, even without a marvellous group of friends from Siblings Together Bee to assist! 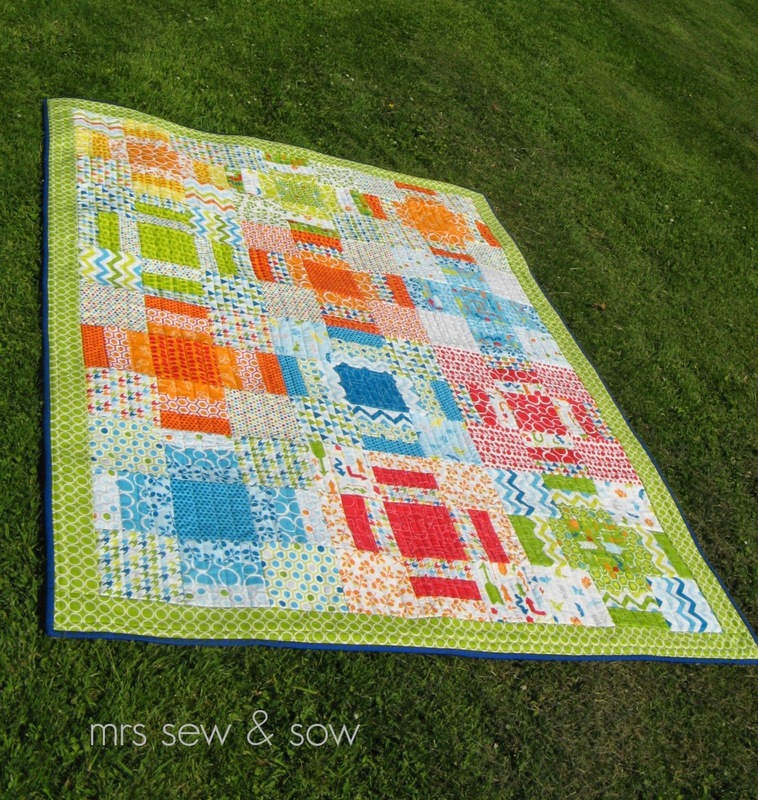 I had some Oakshott I picked up from a sale at least a year ago, and as I hadn't any plans for it, I thought it would fit nicely with the bright colours and the orange border that went round this version of the quilt! 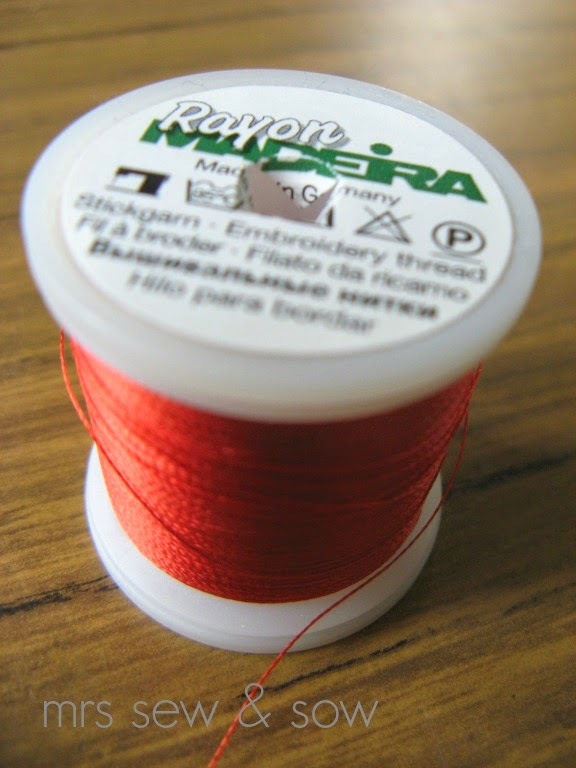 I bound it in a Kona red solid for a bit of contrast. 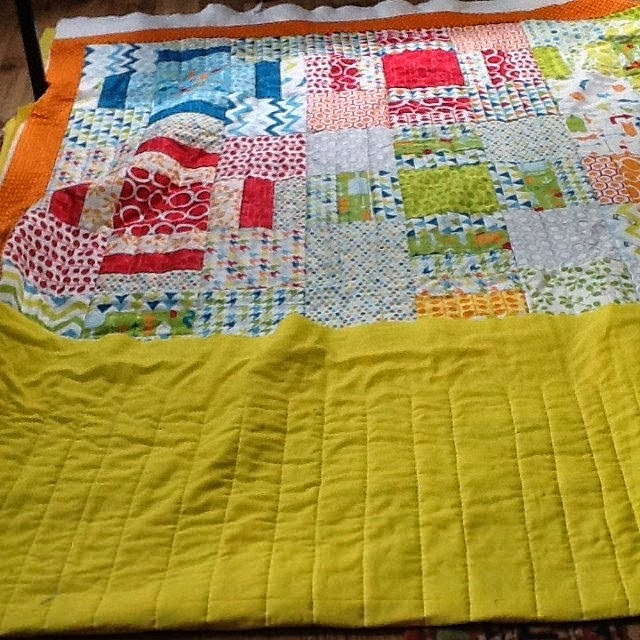 And another quick quilt for Siblings Together and an FQR handover. Now just got my classes to prepare for and my sample swaps to get ready...ok that is still quite a lot! I'm sure I can do it though...(fingers crossed). 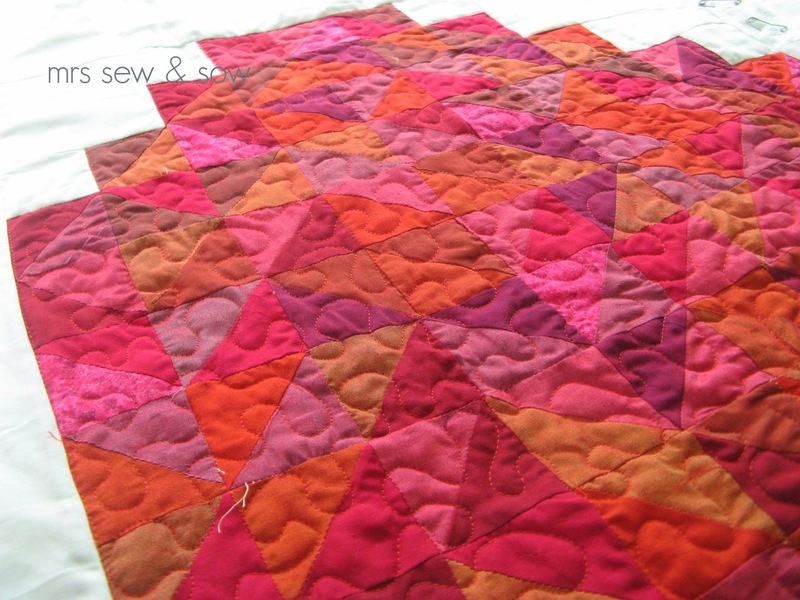 As these are printed I did have to cut reverse triangles ...ie use my template flipped over on the other side. 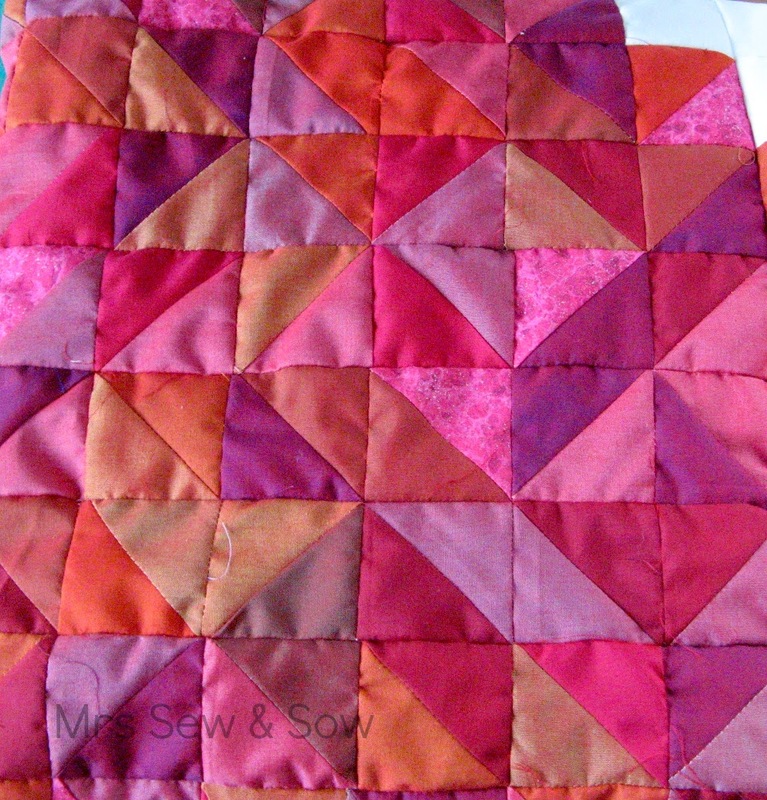 Much quicker to make an electric quilt of course but I like it's potential....and I could play with the colours for hours! 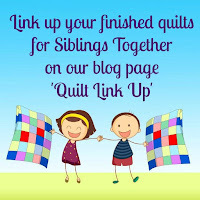 I'm over on Lynne's blog today talking about my Siblings Together Bee quilt. 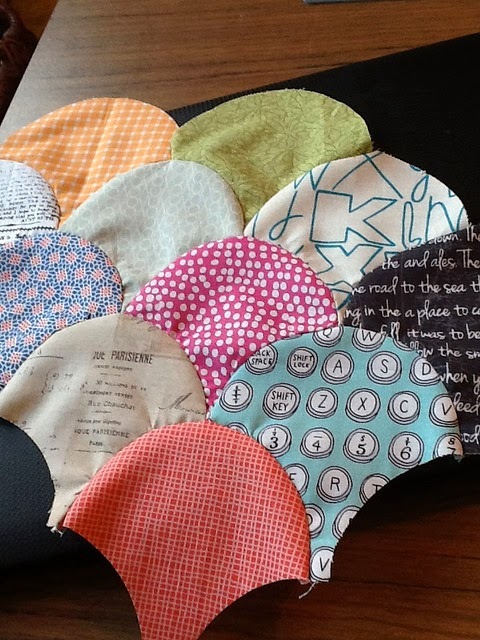 The Finish Along has helped me enormously in tackling my long list of UFOs - so a big thanks to Rhonda, Leanne and now Katy in helping to sort me out. I have to add my lovely friends from the Lazy Bums in the credits as they are helping on a monthly basis. Plus some other helpful regulators on IG and elsewhere - you know who you are and have all helped me this past quarter! 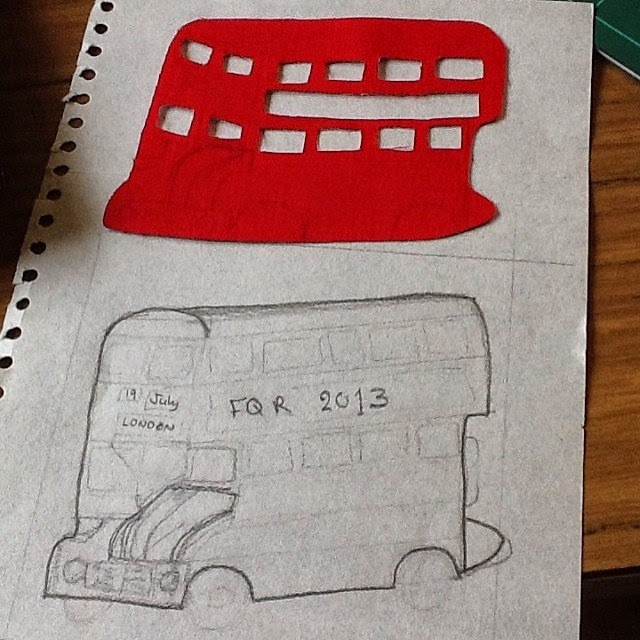 Sample Swap baskets for FQR - using this Routemaster bus design updated to 2014 of course! Could be I've finished one of these already!